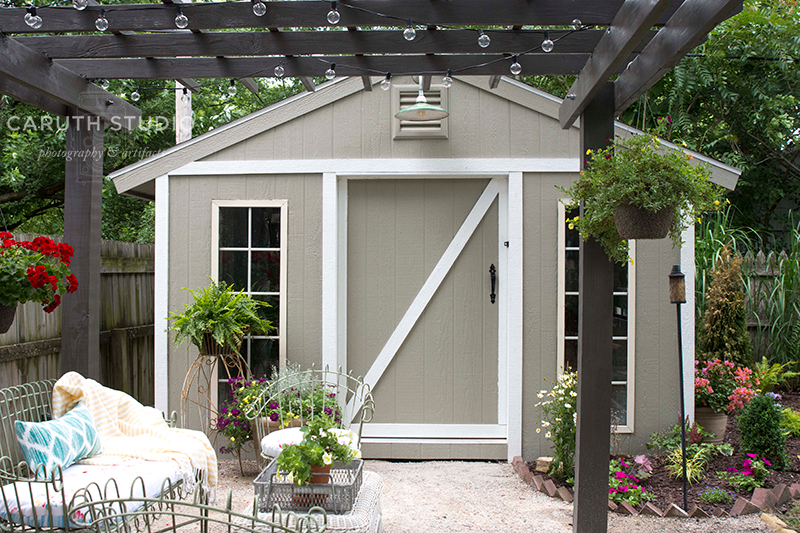 With products from Lowes Home Improvement, our do-it-yourself shed takes on shape with walls and a roof. Since we’re not professional builders, constructing the roof trusses was the most daunting part of this build. But we found a simple way to ensure that each one would be identical to the other. And, it has to be done before you put up the walls. Here’s how we did it. First, screw two 2×4 blocks to the 12-foot wide end of the floor, one at each of the top corners. Place two truss legs together at the angle you want for your roof. Since we were going to be climbing up there to put on shingles, we opted for a fairly shallow angle. Mark the angle and cut the legs to fit together at the apex. Place the truss legs together over the two blocks and mark the place to notch the legs to create what’s called a “bird’s mouth” that will fit over the walls when you raise the trusses. Since our walls are 12 feet apart, we must have 12 feet between the bird’s mouth. Cut the notches. Position the notches in the 2x4s into the 2×4 blocks. One each side, position more 2×4 blocks above the truss legs to hold them in place. Cut 10 gussets from plywood in a pentagon shape with the top angle matching that of the truss apex. Secure the top of the truss with a wood gusset. Nail the gusset to the 2x4s using several nails. Install a 2×4 90-inch collar tie between the 2×4 boards. Mark the angle on each end before you cut the collar tie to size. Hold in place with 2×4 blocks. Cut 20 roughly triangular gussets from plywood (create an easy template by tracing the one end of the collar tie and a truss leg to get the size and shape). Put one on each end of the collar tie. Attach to 2x4s using several nails. Turn this truss over and apply wood gussets to the opposite side. Repeat steps to assemble four more trusses. To make the two end gables, remove the 2×4 blocks at the corners of the floor and insert a 12-foot 2×4-inch gable plate between the bird’s mouth in two notched truss legs cut to the same length and angle as the 5 trusses. Secure the apex with a metal mending plate on the outer side and a gusset on the inner side. Screw the gable plate to the truss legs with 2 ½-inch screws. Mark the angle where the gable stud will meet the truss leg and cut two 2×4 23 ½-inch gable studs. Install them between the truss legs and the gable plate. Nail through the bottom plate and secure the top with metal protection plates. Repeat to assemble another gable. Remove 2×4 blocks. Turn one of the gable frames over letting the bottom plate overhang the floor so the gable lays flat. Install gable siding with a ¾-inch overhang below the gable plate. Attach with nails across the top and bottom edge of the frame. Repeat for second gable frame. And now, finally, it’s time to build the walls. Our back wall measures 11 feet 5 inches wide so we used 2 12-foot 2x4s cut to size for the top and bottom frame plates. Then, we fitted 72-inch 2×4 wall studs between the top and bottom plates on 24-inch centers (adjusting slightly for the reduced width). Narvas assembled the wall frame with two nails at each stud end, squaring the wall frame as he did the floor. (Measure diagonally corner to corner. The measurements will be the same when the wall is square.). Narvas installs the first siding panel with the lap edge extending 3 ½ inches past the wall frame. The bottom will extend ¾ inch below the bottom plate. He adds the other siding panels with the last panel cut to extend 3 ½ inches beyond the wall frame. The siding is mounted ½ inch below the top of the wall frame on all walls and extends ¾ inch below the bottom plate. The sidewalls are built the same way but measure 12 feet wide. So top and bottom plates may need to be trimmed to exactly 12 feet (ours were an inch or two longer) and 72-inch studs again fitted on 24-inch centers. Siding is applied edge to edge on the sides. We’re adding a window on one wall so Narvas and Hannah plan the adjustments to add that feature. When the back and sidewalls are assembled, Hannah and Kurtis raise each wall and level it while Narvas attaches it to the floor with framing nails. A 2×4 brace keeps everything steady until all walls are attached. Our shed will have a 4-foot-wide sliding barn door so we erected two smaller walls on either side of the front. A door header joins the two. As with the back wall, the siding extends 3 ½ inches on the outer edge of each wall. These small walls will also include narrow windows so the framing is adjusted to accommodate them. We’ll cut the window openings out later. With all the walls in place, it’s time to raise the roof. Narvas and Kurtis place a gable on the back wall with the siding extending over the lower wall. The gable is leveled and secured by nailing through the gable plate with framing nails. The front gable is installed the same way. Then, on the top of each sidewall, a 12-foot 2×4 tie plate is nailed atop the framing plate. At each stud, Hannah and Narvas attach rafter ties with screws. The trusses are lifted into the rafter ties, leveled and secured with screws, so that the notches rest on the tie plates at the outside edge of the sidewalls. Don’t look too closely—some of the gussets are upside down! But they’ll still do the job. Finally, the hardest part is done and it’s starting to look like a real building. Can’t wait to start adding the details (like maybe a finished roof).